Inlaid tiles, or ‘encaustic’ tiles as they are also known, are fired clay tiles with a simple pattern such as an heraldic motif picked out in a clay inlay of a contrasting colour, usually in white on a red ground. The tiles are glazed and were originally fired in a wood burning kiln. They depend entirely upon the raw clays and glazes for their colours, and not pigments, paint or enamels. The tiles developed from about 1220 to about 1550, probably earliest on continental Europe, although the basic technique is likely of earlier Middle-eastern origin. They represent a significant development over earlier mosaic tile designs. They were probably inspired, at least in part, by the Italian marble mosaic floors, and attempts to achieve patterned floors with local materials. Encaustic or inlaid tiles enjoyed two periods of great popularity. The first lasted until Henry the Eighth’s reformation in the 16th century, and the second came when the tiles caught the attention of craftsmen during the Victorian Gothic Revival era, who after much trial and error mass-produced these tiles, made them available to the general public. During both periods tiles were made across Western Europe though the centre of tile production was in England. 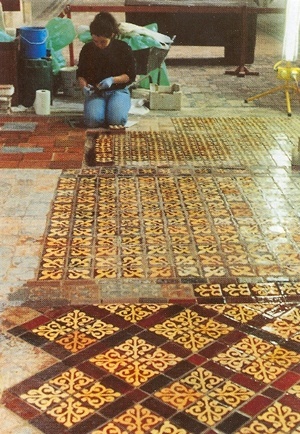 Companies in the United States also made encaustic tile during the Gothic Revival architecture style’s period. The use of the word ‘encaustic’ to describe an inlaid tile of two or more colours is technically incorrect. The word ‘encaustic’ literally means “burning in”. The term originally described a process of painting with a beeswax-based paint that was then fixed with heat. It was also applied to a process of medieval enamelling. The term did not come into use when describing tile until the 19th century. Supposedly, Victorians thought that the two-colour tiles strongly resembled enamel work and so called them encaustic. Despite the error, the term has now been in common use for so long that it is an accepted name for inlaid tile work. In both medieval times and in the 19th and 20th Century Gothic Revival, these tiles were most often made for and laid in churches. Even tiles that were laid in secular buildings appear to be copies of those found in religious settings. 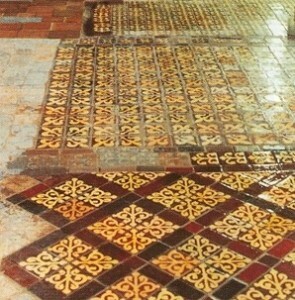 Encaustic tile floors exist all over Europe but are most prevalent in England where the greatest numbers of inlaid tiles were made..
Inlaid clay tiles are common in churches and cathedrals throughout England. Particularly good examples can be found at Lichfield Cathedral, Winchester Cathedral, Cleeve Abbey and Byland Abbey, to name but a few. Some of these tile ‘pavements’, as they are known, have deteriorated to such an extent that it has become necessary to consider drastic measures if they are not to be lost forever. The glaze is substantially harder and more durable than the underlying body. It is this layer which contributes to the durability of the tile. However, in even the best fired pieces, the surface gradually wears over the centuries, until the softer material beneath is exposed and deterioration accelerates rapidly. The coloured inlay, which may be just a few millimetres in depth, wears away leaving just a plain clay body. Replacement of the originals is ethically questionable, as the loss of the original medieval work will detract from the historic integrity and archaeological importance of the building and the new work may confuse the study of the building, particularly if it is indistinguishable from the original. The introduction of new replicas is most appropriate where areas of original tiles have been lost altogether, particularly if no attempt is made to fake the appearance of an ageing tile. In some instances the replacement of originals with replicas may also be justified where originals have lost their pattern altogether. Recreation of the original pattern provides a unique opportunity to present an interior in the manner originally intended, and the effect can be dramatic. At Winchester, areas of new work now form a vivid carpet of colour reflecting the light from the stained glass windows and the elegance of the early English architecture. However, replica tiles were introduced in limited areas only. Winchester Cathedral has the largest area of thirteenth century inlaid tiles still in their original position in England. The tiles have become very worn from continual visitor traffic and daily cathedral life, and in many areas the original glaze has worn away entirely leaving very friable, soft cored, pattern-less tiles behind. 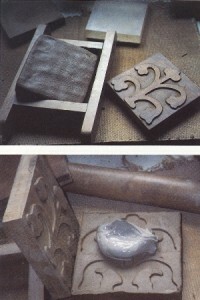 By understanding traditional techniques used in the past and the different types of clay employed it is possible to replicate the tiles with some degree of historic accuracy and to produce a floor approximating the quality as the original. The raw clay has to be cleaned of stones and larger organic matter. It is then soaked and ‘pugged’ before being weighed, wedged into a square shape and placed into the mould to form the tile. 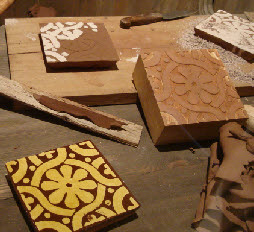 The tile is then stamped to reproduce the pattern in relief, leaving an impression in the surface of the soft clay. Keyholes are also cut into the back at this stage to help drying and to help the tile to key to the mortar when finally installed. The impressed pattern is then filled with a white ‘slip’, a fluid clay mix, and left to dry. When leather hard, the excess slip is cut back, revealing the clear definitions of the pattern. Then the tiles are left to dry completely for three to four weeks. It is known that medieval man only made bricks and tiles during the spring and summer. After drying, the glaze is brushed on to the surface of the tiles and fired. Traditionally a wood fired kiln would have been used. However, today it is impractical to build and fire a wood fired kiln due to the unpredictable results that would likely be achieved. A gas fired kiln has proved a good alternative as it allows a more controllable firing cycle. It also gives sufficient variation in the degree of oxidation and reduction to produce an adequate range of colour tone in the glaze, varying according to the location of the tile in the kiln. The tiles are then laid in a lime mortar bed. Although there is a great contrast between replica tiles and surviving medieval tiles, new work gives a clear insight into the full beauty of the floors as they had appeared in the 13th century. By the time of Henry the Eighth’s dissolution of the monasteries, churches entered a period of decorative stagnation, and many were barely altered until late in the nineteenth century. By that time, surviving medieval tiles were noted and at times preserved. More recent excavation of late medieval secular buildings has led to the discovery of tiles identical with those found in neighbouring churches, and thus the picture of who was manufacturing the tiles becomes complicated. Originally, it was thought they were made by monks associated with the monasteries where the tiles are used. Since being discovered at other secular locations, as well as a greater appreciation of the manufacturing skills involved, travelling companies of tilers seems most likely. Previous Previous post: Will Crystal Palace rise again?